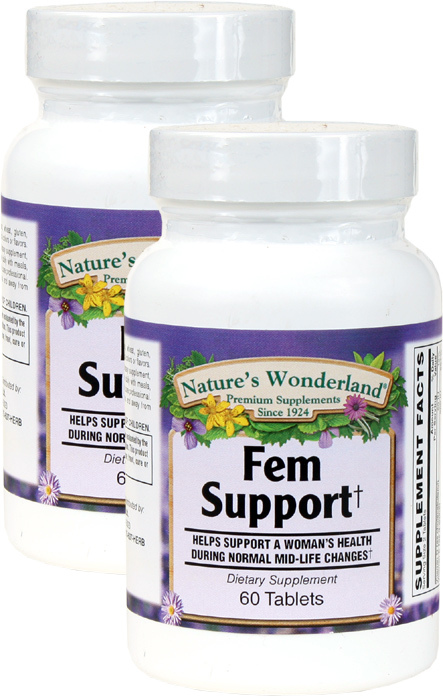 Fem Support, 60 Tablets Each (Nature's Wonderland) - Penn Herb Co. Ltd.
Fem Support balances hormones and minimizes menopausal discomfort. 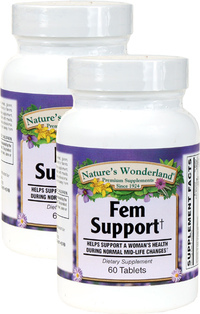 The traditional blend of Black Cohosh, Soy extract, Red Clover and other female wellness herbs supports a woman's health during normal mid-life changes. Soy Isoflavones...supports bone health and helps ease severity of hot flashes. Black Cohosh...the #1 women's health herb for menopausal discomfort. Dong Quai, Red Clover...female tonic herbs promote healthy estrogen levels. As a dietary supplement, adults take two (2) tablets daily with meals, or as directed by a health care professional.